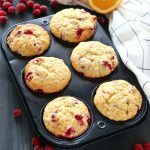 These Cranberry Orange Muffins are packed with tart cranberries and zesty orange flavour and they make the perfect sweet treat or snack! They're the perfect recipe for beginning bakers because they're easy to make with simple ingredients! Preheat your oven to 375 degrees Fahrenheit and prepare a 12-cup muffin tin with paper liners. Add the flour, baking powder, salt, white sugar, and brown sugar to a large bowl and whisk to combine. Add the cranberries and orange zest to the bowl and toss to coat with the flour mixture. In a large pyrex or glass liquid measuring cup, add the egg, milk and vegetable oil., whisking them together with a fork. Add the wet ingredients to the dry ingredients and combine with a rubber spatula just until the flour disappears. Scoop the batter into the muffin cups (filled about 2/3 full) and bake at 375 degrees Fahrenheit for 19-22 minutes or until a toothpick inserted into the middle of one muffin comes out clean.